There are so many wonderful travel blogs out there! The web is full of young professionals and dreamers who have left their corporate jobs to traverse the world. They backpack through the Amazon, lounge in Thai hammocks, eat their way through Italy, couchsurf all around Europe, snap pictures of Moroccan snake charmers and snowboard the Swiss Alps. I never in a million years dreamed that I would have time to sit down and actually read one post from a travel blog, but then again, I never really expected to quit my job and move to Serbia. Then I even started my own "travel" blog - yet another personal shocker! My birthday boy (Chris) and Marko and some homemade rakija. While the life of a worry-free-jobless-traveling-nomad sounds adventurous and exciting, I don’t wish to change our situation at all. We’re still traveling, but we’re doing it a little differently with a company that values my husband and has trusted him with an expat move. While we will see a lot of the world during our three-year contract, we will also have a good understanding of a new culture. There is something very special about truly feeling the heart beat of another country; it completely changes your world-view and you will never be the same again. So far, we’ve learned a bit about Serbia’s history, made a lot of Serbian and Serb-Hungarian friends, participated in a Serbian parade, gone to concerts, learned to spot region specific architecture, been invited to birthday parties, celebrated Orthodox New Year and Easter, tried a lot of rakijas, and just the other day we were invited to the country to meet Marko’s family. 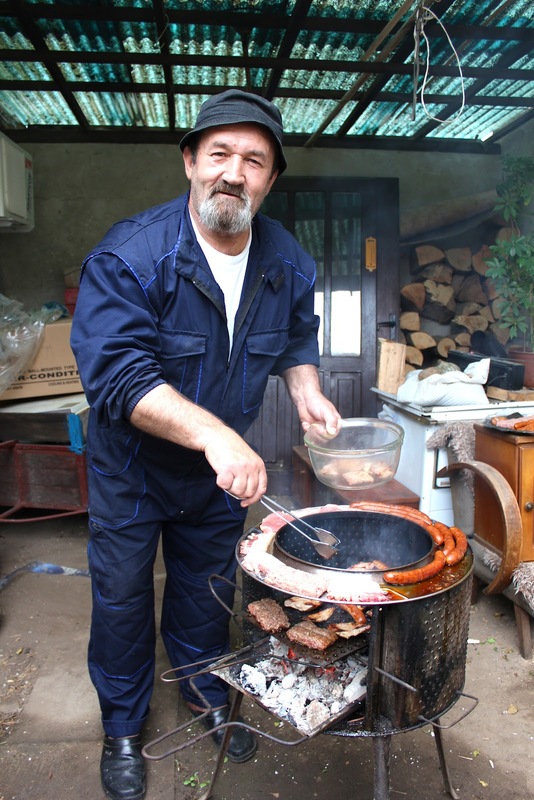 Marko's family owns a goat and several pigs and they simply live off the land. Lot's of little piglets! They're just so cute when they're little. A homemade grill (old washing machine parts) and pork from the farm. Hmmmm . . organic food! Marko's father was such a wonderful host! There is something very special about meeting family – about being invited to share an evening of stories and laughter and home cooked food. Marko’s mother and father live 45 minutes away from Subotica in the village of Lovcenac. Marko’s parents own a small plot of land with a garden, tool shed and a few animals. There they built a small house (now used for storage) that they lived in as they slowly built the larger family home where they raised their two sons. Today they live alone -occasionally babysitting the grand baby and entertaining when their kids come to visit. Marko’s father was an international truck driver during Yugoslavia's glory days. He has since retired, but he sure loves to tell great stories. In a husky, Serbian-Godfather-like voice he recalled his many trips through Europe, the Middle East, and Ukraine. He emphasized his treks through Ukraine because Marko had mentioned that my family has roots there. He looked at my little round Ukrainian face, beat his chest and proclaimed, “You see Lana (and Chris), we are all like family. You belong to us. You belong to us. . . to Serbia." I was truly touched. That is something you don't hear if you're just passing through Serbia with a guide book and a few hours to check out a restaurant and sling back a shot of rakija or two. To truly feeling like you belong takes time and investment in a culture. Sitting across the table from the man of the house makes you realize that regardless of cultural, political and language differences, deep down, we truly are all the same. We are all people and we all belong. Every good father loves his family and ultimately wants to provide the best for them. Watching Marko’s parents interact with their little grandson, with their son Marko, and with two complete strangers, made me think of my own mother and father. It was Chris’ birthday and it was a special time for us to experience another facet of Serbian culture. This is their only grandchild and they just love him to pieces. What a wonderful homemade-Serbian-birthday meal! Thank you (hvala vam) for inviting us into your home and treating us like family. Thank you for making us feel like we "belong." Pretty fabulous, huh?! I was so impressed!